Matilda Dare can’t sleep. Her insomnia is one more reason to move to the quirky small town of Goodnight, New Mexico after she inherits a house, a small newspaper, and two old dogs there. But despite the Goodnight name, Matilda still spends her nights wide awake, and she has good reason after a reporter is murdered. With a mystery to solve, she begins to investigate the town and uncovers more suspects than she knows what to do with. Meanwhile, the hottie cowboy sheriff is doing his own investigation into Matilda, and the mysterious, handsome stranger, who just happens to live with her, is showing up in all the wrong places. As her investigation continues, danger increases, and it might end up spelling lights out for Matilda. 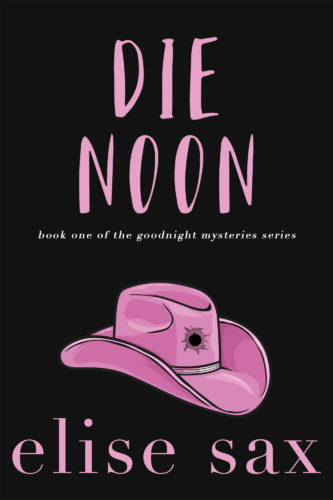 Die Noon is the first installment in the hilarious, romantic Goodnight Mysteries series and a spinoff of the Matchmaker Mysteries. Goodnight…Sometimes sweet dreams end in murder. To receive the latest updates on new releases or sales, sign up for my mailing list below. Your email address will be transferred to Mailchimp & processed by Mailchimp.